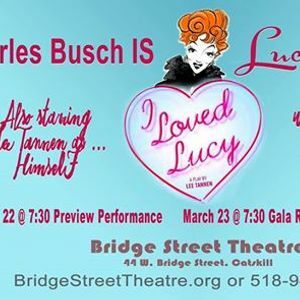 Area audiences are in for a rare treat when theatrical legend Charles Busch and playwright/performer Lee Tannen team up for a special two-performance concert staging of Tannen’s ‘I Loved Lucy’ on Friday March 22 and Saturday March 23 as a benefit for Catskill’s Bridge Street Theatre. This delightful stage adaptation of Tannen’s own 2001 memoir, directed by Carl Andress, stars the fabulous Charles Busch as Lucille Ball, Lee Tannen as Himself, and also features the multitudinous talents of actor/pianist Tom Judson. Few people knew America’s comic sweetheart Lucille Ball the way Lee Tannen did. He first met Lucy as a child but cemented their close and enduring relationship as an adult when he acted as confidant and traveling companion to her during the last ten years of her life. “The play is drawn solely from memory,” says Tannen, “a remembrance of a time in my life spent with a remarkable woman at the end of hers. It’s a loving and candid Valentine to my very own Auntie Mame.” ‘I Loved Lucy’ is an intimate and personal portrait of Lucille Ball as you’ve never seen or known her before, one that will only add to your own love of Lucy. This special benefit concert staging will be presented for two performances only. Tickets to the Friday night performance on March 22 at 7:30pm are $50, $40 for 2019 BST Season Subscribers. The Gala Performance on Saturday March 23 begins at 6:30pm with a catered reception, followed by the performance at 7:30pm and a meet and greet with the performers after the show. Gala tickets are $100, $80 for 2019 BST Season Subscribers. 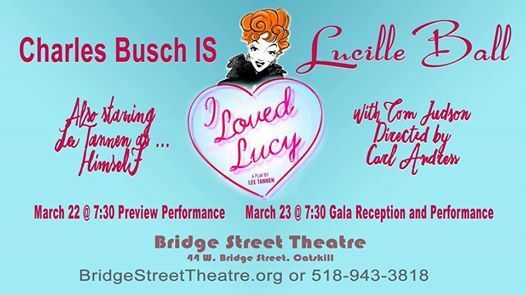 To make reservations (a must – these performances will sell out FAST), visit ILovedLucy.brownpapertickets.com or call 800-838-3006.